During June 2009, Resform construction limited, the concrete formwork contractor of the project commissioned PERI to provide a formwork solution for this project. 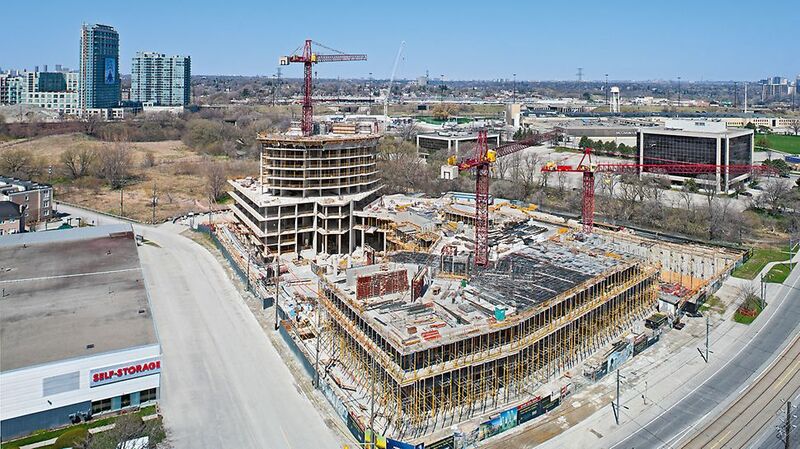 PERI solution must take in to account the tight project schedule, crane limitations, safety, economy and the more than 7 metre high ceilings in the lobby area with complicated combination of beams and drops. 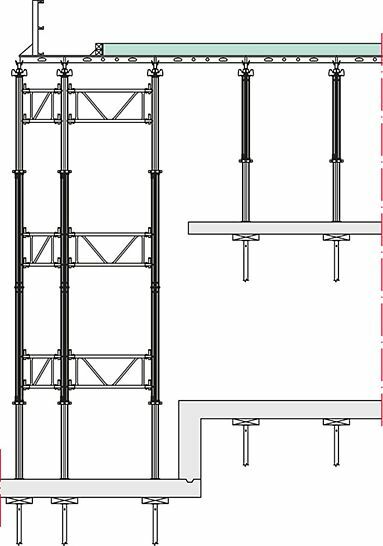 For the lobby area SKYDECK aluminum slab formwork system combined with MULTIPROP aluminum post shore towers provide the ideal solution. Individual MULTIPROPs accommodate heights up to 6.25 m, while higher heights can be achieved by easily stacking MULTIPROPs. MULTIPROPS are easily towered together using various lengths of MRK brace frames which can be fixed both to the outer and inner tubes of the MULTIPROP. 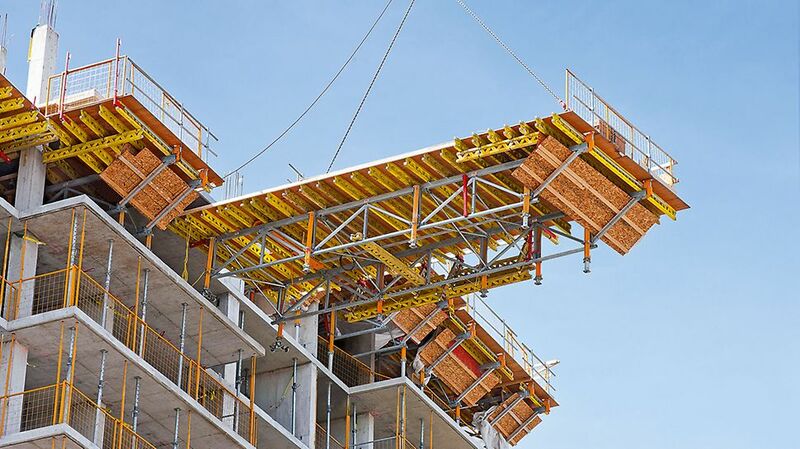 Light weight and solid connection between MULTIPROP and MRK brace frames enables the construction crew to build the MULTIPROP towers safely on the floor and then tilt them up in position. 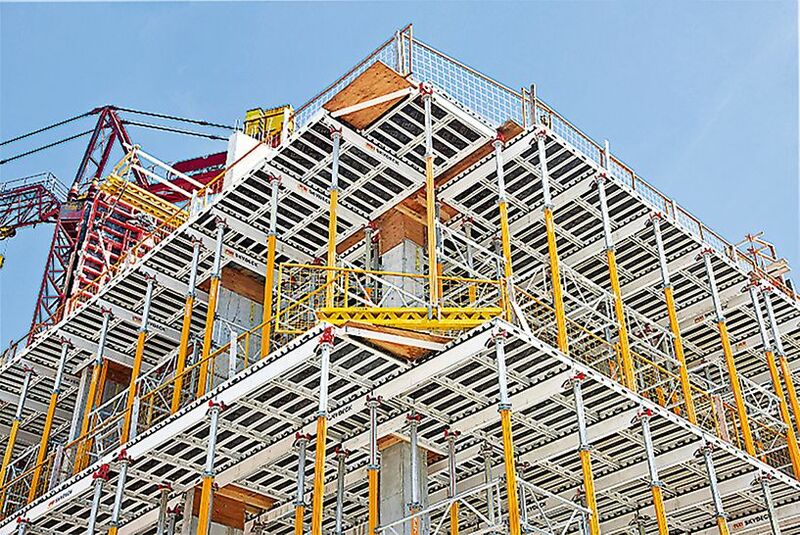 SKYDECK components made of aluminum are light and easily erected and stripped saving time and labour at the job site. Availability of a wide variety of SKYDECK components such as triangular frames, prop heads, drop heads and edge beams allow infilling, adaptation for angles and grid transition be carried out with ease. 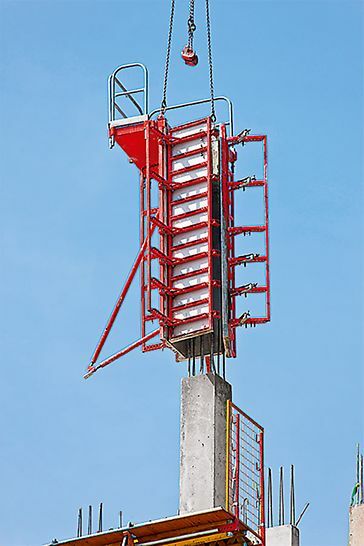 To achieve the desired 3 day cycle on the tower slabs the SKYTABLE provide the ideal solution. 19 Large table units of up to 60 m² area with average height of 2.65 metre were pre-assembled safely on the ground at the jobsite. 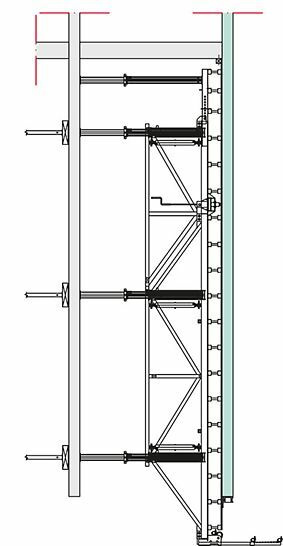 SKYTABLE components are connected together using simple pin and cotter pin connection and moved in to position with a single crane lift. After pouring concrete, stripping of SKYTABLE is very simple and efficient; a quick release device is mounted to each MULTIPROP. Through a simple lever movement, the SKYTABLE is detached from the slab and lowered by 2 cm. After this, the MULTIPROPs provide the larger lowering range. We achieved 3 day cycle in the towers using the SKYTABLE. 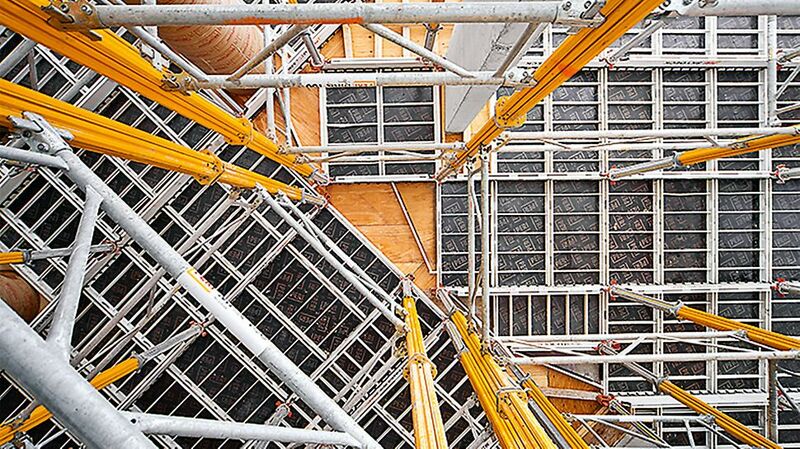 My team likes working with SKYTABLE because the trusses are easily and quickly pulled out from the poured slab and taken to the next level. For moving the tables after stripping PERI has developed a safe and easy solution. Using a simple chain and block system, the PERI STM lifting mechanism pulls SKYTABLE effortlessly out of the building. The SKYTABLE is fully connected to the crane while still inside the building. During the entire moving process, workers stand on secured position and control lifting mechanism using a wireless remote control ensuring the slab table is kept in a horizontal position. At no point workers need to stand on the SKYTABLE itself. The speed and efficiency of SKYTABLE moving operation results in minimum crane time use.